Pete's New Haven Style APizza, a local pizza establishment, had to send out an apology email to customers for using the Washington Redskins name in a promotional email after they received feedback from offended patrons. The Clarendon pizza joint sent out an email letting consumers know about different specials and discounts based on how many touchdowns the Redskins scored. Then, 6 hours later, the ownership sent out an apology letter email and vowed to never use the name again calling it "hurtful" and "offensive". Terry Bradshaw was on Craig Furguson the other night and the topic of the Washington Redskins name popped up. Bradshaw kept refusing to say the name making an overexaggerated noise and head shake before it was said, but ended up saying 'Redskins' later in the interview. "In today's world that we live in, if it's totally offensive to a group of folks we really need to consider whether we need to pursue it"
"And if you changed it to whatever, I don't think it's gonna...and as bad as they've been I don't think anyone will care anyway...NO I DIDN'T SAY THAT!!!" Yep that title is pretty much all I've got for this. Gio often takes pictures of his dog doing human things like reading books, or wearing human clothing. Here is one that the Nats pitcher posted on his Instagram the day after the Redskins game (0-1) for some reason. 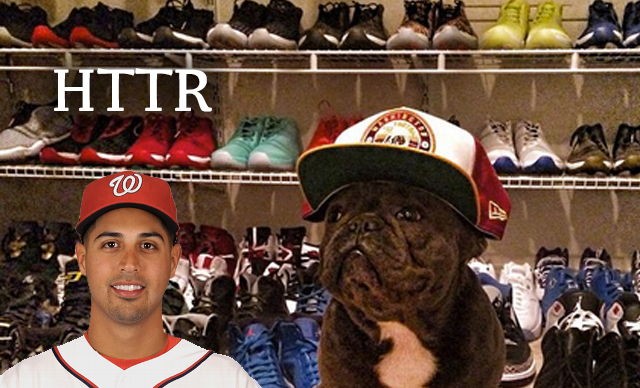 It is the dog wearing a Redskins hat and modeling one of Gio's billion pairs of shoes. He even used the hashtag HTTR, which could be real or sarcastic. If you are not aware, Tosh.0 is a TV show on Comedy Central where the host Daniel Tosh more or less shows YouTube videos and makes jokes about them. It is pretty funny (when they aren't showing videos of people breaking their legs). On Tuesday night's episode, Tosh did a bit about a lingerie football coach and had former Washington Redskins Lavar Arrington and Joe Theismann help him out with the bit. 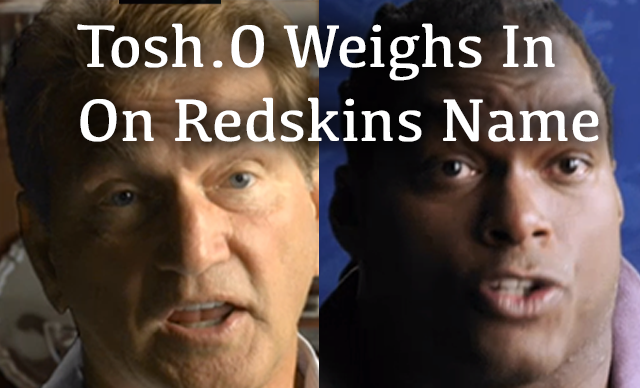 But unbeknownst (probably) to Lavar & Joe, the Tosh team added an anti-Redskins name subtitle on top of their segments. Then definitely unbeknownst to Lavar, they threw in a Penn State Sandusky joke in there too. 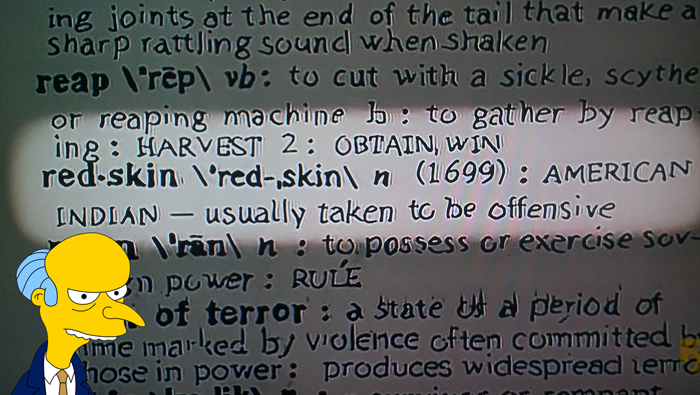 Here's the Anti-Redskins subtitle, and Lavar's reaction. The following picture was sent to me from one of my friends that works out in Ashburn. They went to McDonalds and ordered a silly $1 any size drink. You won't believe what the cup looked like from the Mackers only miles from Redskins Park in the state of Virginia over an hour from Baltimore. Yep. 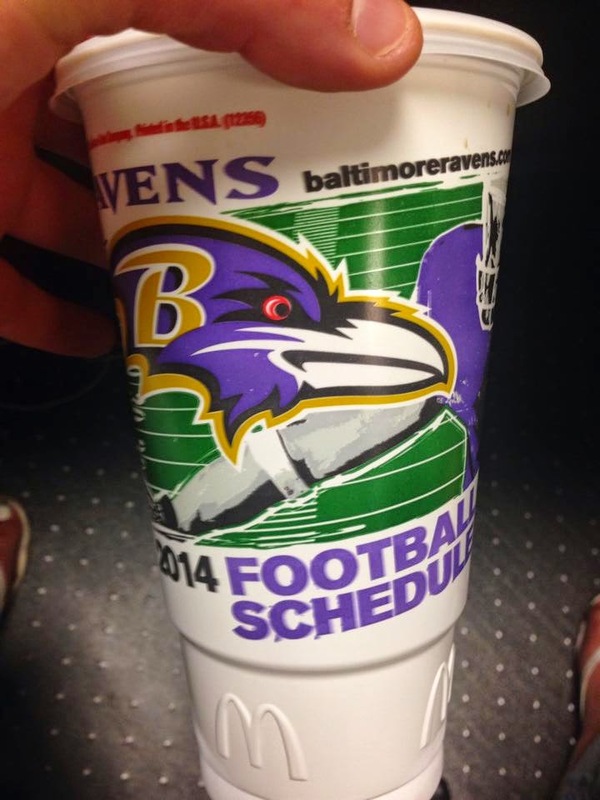 That's a Baltimore Ravens cup. With their 2014 schedule. From ASHBURN McDonalds! Why is this happening. My friend said she threw the drink in the McDonalds drive thru guy's face. Not really, but that would have been acceptable right? A way to insult everyone, no matter what the color of their skin. We can have racial caricatures of EVERY race on the helmet to even things out. Equality. 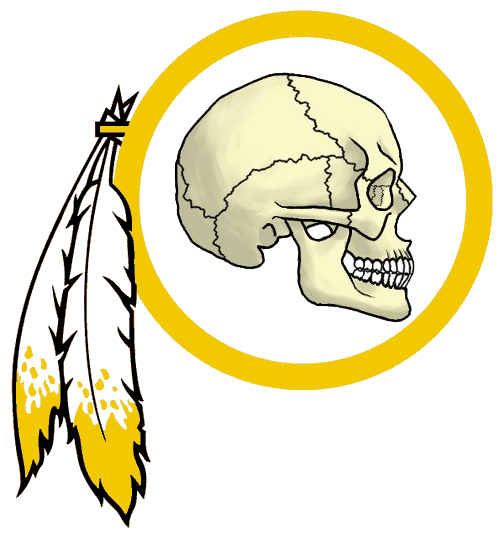 Just take the current Redskins logo, remove the skin, and bam. No longer racist. Now just gross and morbid, kind of like the team's typical performance. 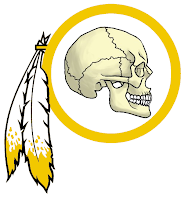 Plus the Cowboys fans calling them the Deadskins would be less of an insult. Naming the team after a cool movie about street gangs would be cool. So long as their logo was the roller skating guy with the switchblade. Jason Whitlock subbed in for Michael Wilbon on Pardon the Interuption, and he had some very interesting opinions about Robert Griffin III. Either very interesting, or very "trying to make himself part of a news story". On the second top story of the show (after Johnny Football) Tony & Whitlock discussed RG3 starting game 1. This causes Whitlock to compare the Redskins QB to people like TO, Ocho Cinco, Tiger Woods and even Kim Kardashian. It was the biggest night of the summer. 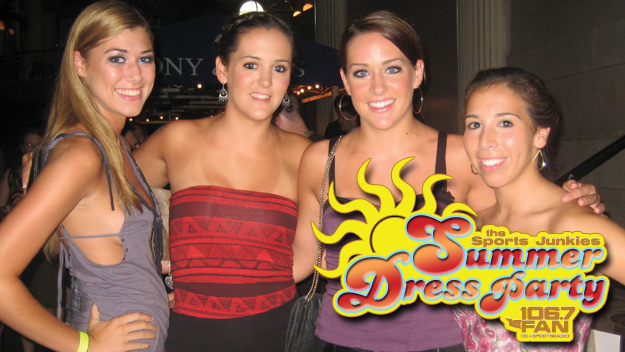 The night of the annual Sports Junkies Summer Dress Party. And needless to say, I was cised. At around 5pm I went to Outback and ordered basically everything on the menu. This was designed to fill my stomach up before a night of endless drinking. I wouldn't mention this part of the story but it literally "comes up" later. I arrived at the Clarendon Ballroom right at 7pm, walked up to the rooftop, and my jaw dropped. Why? Was the girl in the purple dress in front of me? 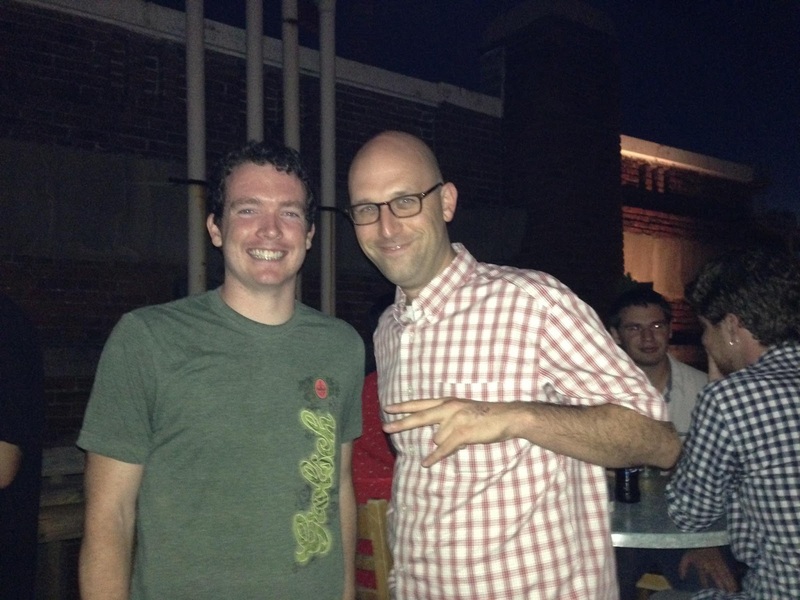 Was Chris Cooley hanging out? Nope, there was another reason. These dudes may have looked like donks, but they did avoid the hour long line that would start to form outside over the next few hours. As time went on, the ladies began to show up, and next thing you knew the entire rooftop was jam packed with athletes, local celebrities, junkies listeners, and hotties in sundresses. I spent the night talking to Valdez about Mama Griz, trying to steal E-Wadd's date, heckling Cakes for playing his sound effects, and learning about seafoam from Tucker Barns. this crappy website, and it was embarrassing. It was a typical fun Junkies event. Zings were flying all over the place. At one point in the men's room a guy said that he didn't want to use the urinal, and he wanted to use a stall. This was my opportunity. 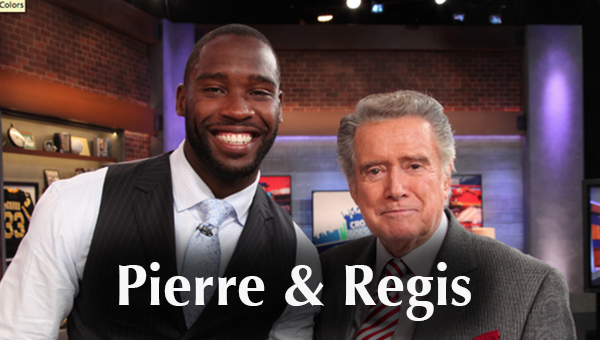 "What's up Dante STALLworth!" Someone said "good zing" and so my night was made. There were so many cool people there that I forgot to holler...and before I knew it I was too drunk to. It was time to go. 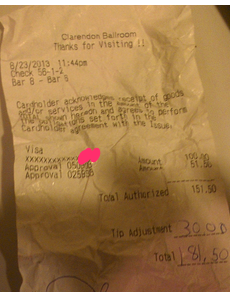 I went to the bar to close my tab, and was shocked to find that I owed $150. I looked at the receipt and despite the bar having the dumbest tab system ever (you tell them a # instead of your name) everything checked out. I was too drunk to be at the bar, and did not need or want another drink. But the bartender was excited for the $30 tip and he handed me a free shot of Fireball. I took the shot and after that, blank. When my mind returned I found myself at the Vienna Metro station puking in the grass. After watching both my $40 Outback bill and my $180 bar tab splatter on the ground in chunks, I grabbed a cab and headed to my parent's house (closest to the metro). As the cab pulled into the driveway at 2am I realized that I was felted. I had $0 in my wallet. I went in the house, saw my mom's purse sitting on the kitchen counter, stole $30, and paid the driver. The perfect ending to the perfect night.